This large waterbug, known as the saucer bug, occurs in ponds, lakes and canals amongst dense vegetation. It is a fierce predator, feeding on a range of invertebrates including water shrimps and insect nymphs and larvae. It pierces its prey with a stout rostrum which can inflict a painful ‘bite’ if handled carelessly. Overwintered adults mate from late February onwards and eggs are laid between April and May in the stems of aquatic plants. Adults of the new generation appear in late summer. Although I. cimicoides is fully winged most individuals have reduced flight muscles and are unable to fly, but flight has been observed in England and Denmark (Denton & Rordam 1998). 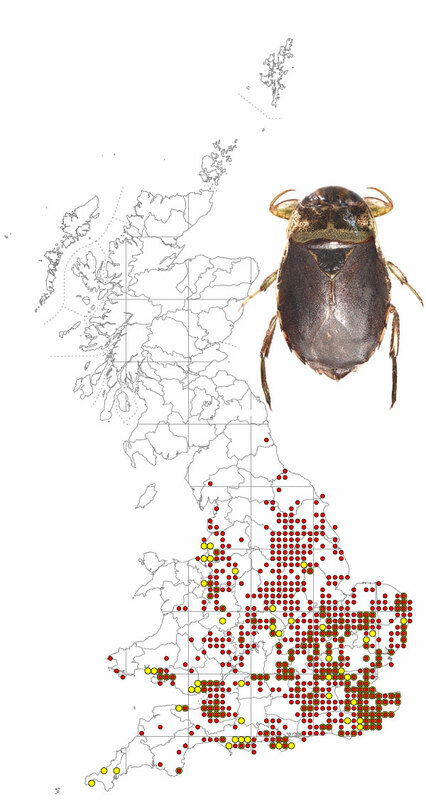 Local dispersal probably occurs by nocturnal walking; the middle and hind legs are less modified than in most British waterbugs and the insect can walk rapidly. The above map is based on records from NBN Gateway, with yellow dots showing pre 1990 records, reds dots 1990 – 2015 records and red on yellow dots overlapping records. A widespread species in England, also occurring in Wales, but absent from Scotland and Ireland. Ilyocoris cimicoides is a large water bug, length 12-15 mm, which is unlike any other British species except for a recent (2004) arrival in Britain, Naucoris maculatus, which at the moment is confined to sites in Kent and Sussex. N. maculatus is smaller (9.8-10.4 mm), lighter in colour and has five more or less distinct dark marks on the pronotum.